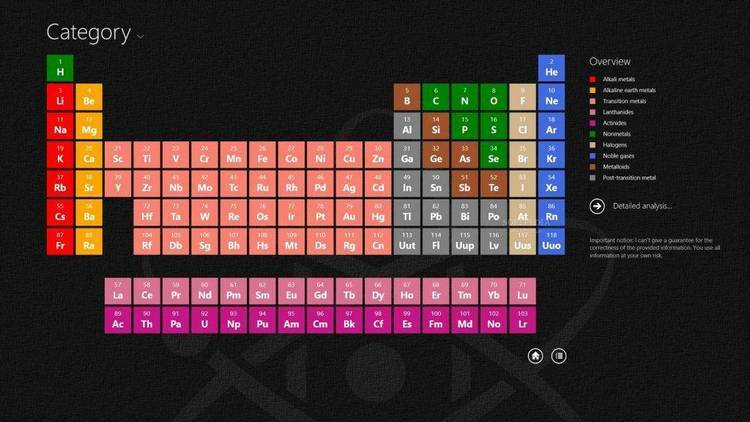 A periodic table of the elements for Windows. Copyright 1991, SMI Enterprises Corp. The software and accompanying written materials are provided "AS IS" without warranty of any kind. The entire risk as to the results and performance of the software is assumed by you. SMI Enterprises will not be held liable for any reason for any cost you may incur, or any potential income you might lose as a result of using this software. This program is not a utility or a comprehensive Periodic Table data base. It is a program that provides some interesting facts about the elements, and demonstrates some Windows concepts. PERIODIC.EXE The executable Windows program. All these files must be included when you distribute this program. Simply copy all the files to a directory of your hard disk. You may then start the program using the Run command of either the File Manager or the Program Manager. You can also add PERIODIC to a group in Program Manager if you wish. When PERIODIC.EXE is started it will open a maximized window showing the Periodic Table of the Elements. Each box will show the elements symbol centered. The atomic number for the element is shown in the upper left corner of the box. Along the bottom of the box is some additional data depending on which level of detail you have chosen. By default it will show the elements atomic weight. It also displays a legend window at the top that shows what the different colors represent. The command menu for PERIODIC is very simple. There are two menu items, Options and Help. The Options menu has three commands. to use. You can also change the color used to represent the different groups of elements. You can turn the legend on or off. You can choose which set of details you want displayed at the bottom of each element box. You can also set which mode of displaying the colors of the elements; either by Group, Date, or Temperature. SaveThis command saves the options you have chosen from the Set... dialog in the WIN.INI file. This allows Periodic to start each time with the options you like best. ExitThis command closes the Periodic window. The Help menu has three commands. Help on HelpThis command displays the Windows help on how to use the help system. The Legend window is a non-modal dialog box that you can move around the screen as you choose. You can also close the Legend with its system menu. It also has one additional feature. If you double click on one of its color boxes, a dialog box will be displayed that allows you to change that color. If you choose the OK button the Periodic Chart will be redrawn using your new color. If you want this color made permanent then use the Option Save command. You can return to the default color by choosing the Default button. If you close the Legend you can restore it by using the Option Set command. The information displayed in the Legend window varies with the Mode choosen in the Set Options window. The main window is where Periodic displays its chart. Along the left each period is labeled. (If you have selected the Electron level of detail each period is shown with the number of electrons in filled shells.) Along the top each group is labeled. If the mouse pointer is over one of the element boxes it changes to a hand pointer. If you click on the element pointed to a Details dialog box is displayed. If you have chosen the Date or Temperature mode a horizontal scroll bar will be displayed at the bottom of the window. The Details dialog box shows the element name, symbol, atomic weight, atomic number, electron shell configuration, the subshell that is filling, the boiling and melting points, a description, the discoverer, and, if known, where the element is found and some of its uses. In the upper left corner of the dialog box is an icon showing an approximation of the element in its state at room temperature. Under the icon is a button labeled with the general type the element is classified in (i.e. halogen, metal, etc.). Pressing this button will display a dialog box describing that type of element. At the bottom is a row of buttons. The OK button will exit the dialog box. The Help button will display a help window on the dialog box. The buttons on the left are shown under the label 'Period'. Pushing one of these buttons will move to the corresponding element in either the period above the current element or the period below the current element. The buttons on the right are shown under the label 'Group'. Pushing one of these buttons will move to the corresponding element in either group to the left or right of the current element. The main purpose of writing this program was for getting myself used to writing Windows programs. It became quite an education. After the program was competed, we decided that it might be useful for others to see how some of the things it did were accomplished. We decided on a two tier approach to licensing the program. First of all, it is a shareware program. You are granted a 30 day trial license. If you use the program and like it you will need to pay a $10.00 license fee to continue using the program. You are also free to distribute all the files listed above provided that the files are maintained as a unit. In other words, you cannot distribute only the PERIODIC.EXE without PERIODIC.HLP and PERIODIC.WRI. Also, if you charge a fee, you may charge ONLY for duplicating the files, not for the program itself, up to a $3.00 maximum. Conversly if you paid anyone other than SMI Enterprises for this program you paid only for a duplication service. You still need to license the program from SMI. Secondly, if you would like to see the code that makes it work you can pay a $20.00 license fee and get all the source files needed to build the PERIODIC.EXE program. This includes all the icons, bitmaps, RC, dialog, and DEF files. In addition, you also get all the source files needed to build the PERIODIC.HLP file. Plus, you get a file, in Windows Write format, that explains certain sections of the program in more detail than the program comments. We think this is a tremendous bargain. The one restriction on the use of these source files is that YOU CANNOT DISTRIBUTE ANY OF THESE LICENSED SOURCE OR DOCUMENT FILES. These files are copyrighted by SMI Enterprises Corporation. However, YOU MAY INCLUDE THESE FILES IN PROGRAMS YOU WRITE as long as you indicate that fact in the copyright notice of your program (for example, in your About box). If you wish to license either version please use the order form on the next page. Periodic is licensed on a per user basis. This license grants the user the right to install and use the software on one or more computers so long as the total number of users does not exceed the license quantity. I understand that the license that I am purchasing allows me to use this product for my own educational purposes, or as components of another program, so long as there is a notice to that effect crediting SMI Enterprises. I also understand that none of these source or document files may be distributed, by any means, except as provided for above. (918) 560-9536ogram was competed, we decided that it might be useful for others to see how some of the things it did were accomplished. 24ce }<.0UWqs|~< e g )!+!\!^!!!!!@"""<"#7#o#q###%%^%`%%%%%%&! @"""
%as the total number of users does not exceed the license quantity.